Gaza fell silent on Tuesday after a month of intense combat, as a 72-hour truce accepted by Israel and Hamas came into effect and the last Israeli troops left the battered enclave. 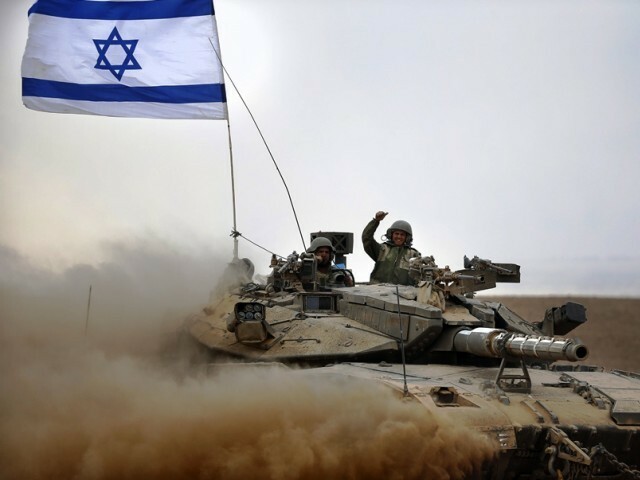 Just minutes before the ceasefire took hold, however, Israel’s military and Hamas both engaged in displays of firepower, seemingly determined to have the last word on the 29th day of their hostilities. Sirens wailed in Jerusalem and Tel Aviv as Hamas fired a barrage of 16 rockets over the border, one of which hit a Palestinian home in West Bank, causing damage but no injuries, witnesses said. And in Gaza, Israeli warplanes staged at least five air strikes before the truce took hold. Israel also said all of its troops had withdrawn from Gaza after completing a mission to destroy a sophisticated network of cross-border attack tunnels, ending a ground operation which began on July 17. “All of them have left,” General Moti Almoz told army radio. Lieutenant Colonel Peter Lerner said troops would be “deployed in defensive positions” outside of Gaza and would retaliate to any violation of the truce, which was announced by Egypt late on Monday. “The IDF will respond if it is attacked,” he warned. Medics said there were no deaths or injuries since midnight, although two people succumbed to injuries, putting the overall toll at 1,867. On the ground, medics went into areas previously been inaccessible, with the worst devastation near the southern city of Rafah, which had been flattened in a massive Israeli assault which began Friday. There they found the bodies of five people – two from Hamas and three from Islamic Jihad. Elsewhere, people were slowly returning to homes they had fled after being ordered out by the army, with dozens of people in the northern town of Beit Hanun heading home in cars or on donkey-drawn carts, an AFP correspondent said. Among them was Rafat al-Masri, a father of five who found his family home in ruins. “I’ve worked 40 years to have this house and now it is all destroyed,” he said. It was the second time in four days that the two sides had agreed to observe a 72-hour humanitarian truce deal, with the last attempt on August 1 – brokered by Washington and the UN – shattering in an explosion of violence within just 90 minutes. The latest breakthrough emerged in Cairo where Palestinian and Egyptian mediators had held two-days of talks with Hamas and Islamic Jihad representatives. Israel and Hamas, the de facto power in Gaza, separately confirmed they would abide by the new 72-hour ceasefire. Hamas spokesman Sami Abu Zuhri said a delegation of the movement’s Gaza-based leaders would head to Cairo on Tuesday to join representatives of its exiled leadership. And Israel said it would also send a delegation after earlier refusing to join the talks, an official said. The agreement by both sides to hold their fire for three days was hailed by both the United States and the United Nations. Both said the onus was on Hamas to uphold its end of the deal. Images of the bloodshed – which has cost the lives of 1,867 Palestinians and 67 people on the Israeli side – have sent tensions soaring and earned the Jewish state increasingly harsh criticism for the high number of civilian casualties. Israel said it had withdrawn its forces after they had destroyed a total of 32 cross-border tunnels. “They were part of a strategic plan of Hamas, and an investment of approximately $100 million worth of materials and we have now removed that threat,” Lerner said. Troops also hit some 4,800 targets and had killed “900 terrorists,” he said. “We struck just over 3,000 rockets; they launched over 3,300 rockets and we expect that they still have about 3,000 rockets left. This is a challenge we have to address,” he said. As the fragile calm took hold, Intelligence Minister Yuval Steinitz said only time would tell if it would last. “I am sceptical. Hamas has already violated six previous truce agreements, I hope that this time will be different but we have to wait and see,” he told public radio. Negotiators in Cairo are likely to face some tough challenges with both sides making conflicting demands. The Palestinian have insisted that Israel end its eight-year blockade of the enclave and they also want the border crossings opened. And Israel is demanding Gaza be fully demilitarised, making a link between international efforts to achieve that and the Jewish state’s facilitation of the necessary reconstruction of the war-torn enclave.